German rabbi; father of David Fränkel; born at Berlin June 30, 1739; died at Dessau Feb. 20, 1812. In 1787 he settled at Dessau, where he filled the office of rabbi; he was at the same time "Messrabbiner" at Leipsic, during the periodical fairs. Possessed of some means, he not only refused a salary, but also supported young Talmudical students. In cases of inheritance submitted to him for decision, he often, when the amount was not large, satisfied both parties by paying out of his own pocket the disputed sum. 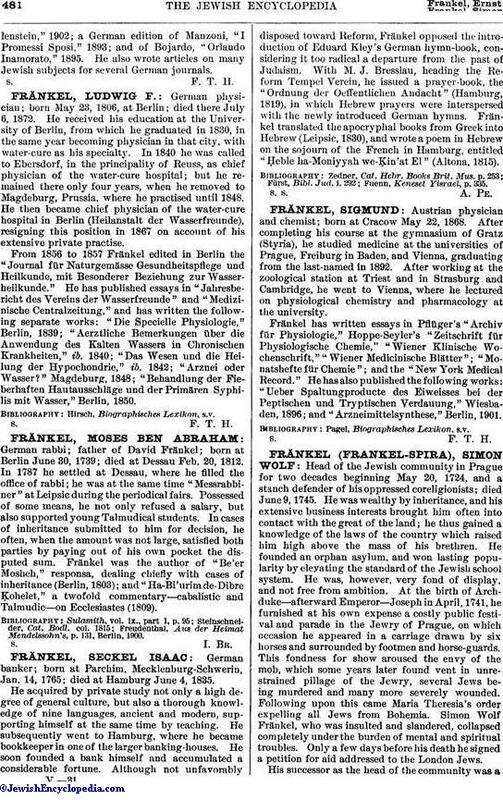 Fränkel was the author of "Be'er Mosheh," responsa, dealing chiefly with cases of inheritance (Berlin, 1803); and "Ha-Bi'urim de-Dibre Ḳohelet," a twofold commentary—cabalistic and Talmudic—on Ecclesiastes (1809). Freudenthal, Aus der Heimat Mendelssohn's, p. 131, Berlin, 1900.